Most of the time, Discord installs very quickly and easily. Occasionally though, some people encounter issues with its installation. If your Discord installer fails or outputs various errors that prevent the Discord app from installing, the steps outlined below will often rectify the issue. Find Discord in the system tray and close it. Make sure all Discord processes are terminated. Open Task Manager (right click on the task bar and click Task Manager). Scroll through the list of programs that are currently running on your system. If you see anything that says Discord, right click on it, and select End Task. Press Enter or click OK. 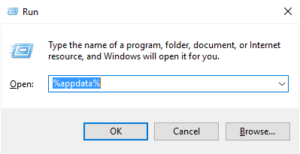 The %appdata% folder will open. Find the Discord folder inside the %appdata% folder and delete the Discord folder. Press Enter or click OK. The %localappdata% folder will open. Find the Discord folder inside the %localappdata% folder and delete the Discord folder. If Windows says the file is in use, you have Discord running somewhere. Open the Task Manager again and make sure you ended all Discord tasks. When you have managed to delete the two Discord folders, continue. Here is something else you can try. Make sure that all instances of Discord are closed as above. Check Task Manager to be sure. Run Discord (%LocalAppData%/Discord/most recent version) as an administrator. Find the app at that location (%LocalAppData%/Discord/most recent version), right click it, and select Run as Administrator. While you’re there, set Compatibility to Windows 7. If that doesn’t work, set Compatibility to Windows 8. That completely exhausts my knowledge on this topic. If you continue to have issues with Discord installation, you should contact Discord Support.